A few years ago I heard someone say if you publish your goals for the year you’ve a greater chance of achieving them. I suppose it’s the fear of failing in front of a wider group of people which motivates you to succeed. So this post is to set out my goals for the year – to make them public so I have to go through with them. We’ll gloss over the fact that when I researched this quote all I could find was reasons not to tell anyone your goals! To kick off the season I am lucky enough to have a London Marathon place by virtue of my time last year (pays to get a bit older!). Swiftly followed by the Outlaw Half. Hopefully my legs will have recovered from the marathon for this. I’ve finished fourth in my age group for the last two years having come in second off the bike – I need to rectify this and stop my head falling apart on the second half of the run! 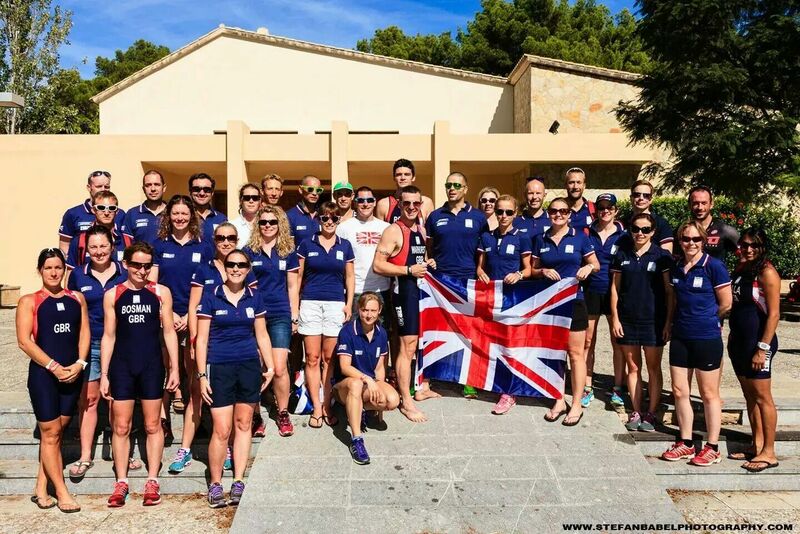 Having qualified for the Standard distance at the World Champs in Cozumel, Mexico, we were given the opportunity to also race in the aquathlon as well. It’s traditionally the opening event of the championships and is a great opportunity to race early in the week and get rid of those pre-race nerves before the main event. So, I decided it would be a good idea to give it a go. I should confess that I have never raced an aquathlon before so I was a little nervous to be honest. Luckily the format of the race in Mexico was different to what most people had done before in that it was 2.5km run, 1km swim, 2.5km run. So everyone was technically in the same boat as me! The water temperature was around 29-30°C so no need for a wetsuit! It felt strange entering transition without a bike to rack. We were faced with three long lines of little orange vegetable baskets in which to place our kit –i.e. goggles, hat and a number belt! It took all of 5 minutes to set up transition, work out how far along your line your basket sat and determine the in/out route. The start was a bit strange as it was your traditional run start with everyone jostling for position over the first 100m. My wave had three age groups so there were a fair few of us. The first 1km or so was at breakneck speed – imagine parkrun on caffeine! It soon settled down and I realised I needed to slow down if I was going to manage to swim and run again so I backed off the pace a bit. 2.5km flew past and before I knew it we were running into transition along the marina to swap our shoes for goggles and a hat. I took a few seconds to put my hat on properly and ran along to the pontoon ensuring my goggles were secure. This is the only time I’m likely to have to dive into the water for a race so we had spent a bit of time practising the previous day. I wear contact lenses so can’t afford to lose my goggles – and after the successful practising yesterday, disaster, they came off! After a bit of treading water to sort myself out I cracked on. The swim was awesome – beautiful clear blue water and loads of tropical fish. With the run beforehand there was none of the usual scrum and it meant there was plenty of clear water to swim in. As I approached the first buoy I was rather surprised to see a diver underneath me taking photos – don’t get that in the lakes in the UK! I started to pick people off although it was difficult to tell if they were my wave or age group. A few girls came past me as well and the swim was over before I knew it. I ran back into trans ition and grabbed my shoes. Downside of sea swimming is that horrible salty taste. Luckily there was a drinks station just up from transition and I grabbed a pouch. Now to start running. 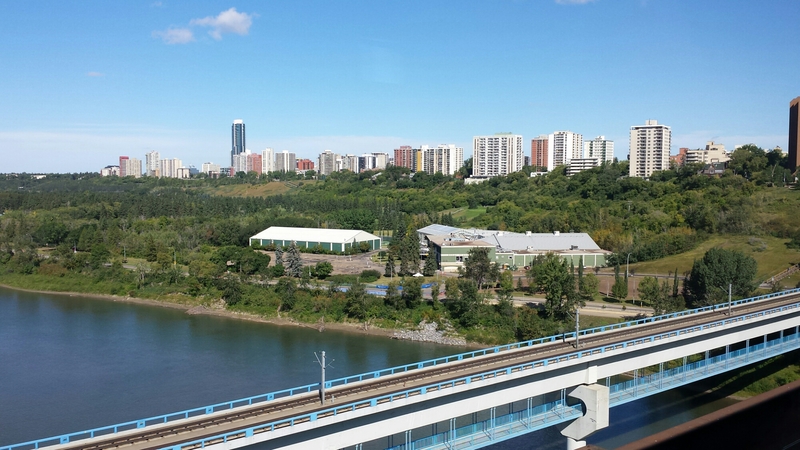 With only 2.5km there isn’t a lot of time to get going so it was head down and get going. I picked quite a few girls off, probably most of the ones who had passed me in the swim and tried to hold on. The final km had an out and back section so I could see those in front of me. I was quite surprised to see I was quite high up among the GB girls although as we were mixed waves it was difficult to be sure where you were in your own age group. I managed to pick a few more off including a GB girl and felt really strong by the end. It was great to cross the line that Ali Brownlee had just an hour before and I felt I’d done a good job. Race morning started a bit earlier than I had planned due to the storm that hit Chicago the previous evening. As a result pre-race racking was postponed until race morning. It was only just light at 7am as I left the Fairmont Hotel (our home for the week) at the top end of Grant Park but surprisingly warm considering the predictions, although my choice of trisuit and team jacket caused some amusement to a pair of Australian competitors who I chatted to at the traffic lights who thought it was rather cold in their woolly hats and thick tights! Transition was around a 10 minute ride from the hotel and was a good opportunity to test out my last minute pedal and tyre changes – I found a large piece of glass in my tyre and my pedals seized up on the crossing from the UK! How not to be relaxed the night before a race…anyway, short test ride was fine and after the most minor of checks on transition entry (just my brakes – nothing else at all) I eventually found my racking spot. Transition was rather large, rather wet, rather muddy and very sandy – that’ll be nice later! I had quite a nice spot in transition not too far from the end of a row and set my stuff up. 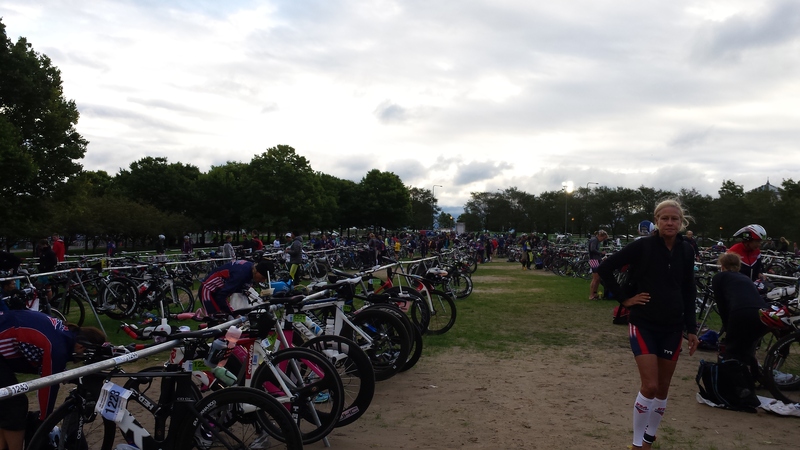 A few of my GB team mates were racked near me and we did a quick scout of swim entry, bike and run exits while doing the usual faffing around with kit. Once I felt happy with it all I took an easy walk back up to the hotel for breakfast. With my race not until 11am I didn’t want to hang around the race area and thought I’d be better off chilling back at the hotel for a bit. I headed to swim start about an hour before my wave to see if I could work out the best starting spot. The swim reccy didn’t enable us to swim the first half of our route so it was a case of winging it and hoping for the best. Following the storm the lake was quite choppy, even within the sheltered Monroe Harbour. From what I could see from previous waves the worst place to start was on the right – not only was it the tightest spot, there was also the danger of someone from a previous wave swimming head on into you. 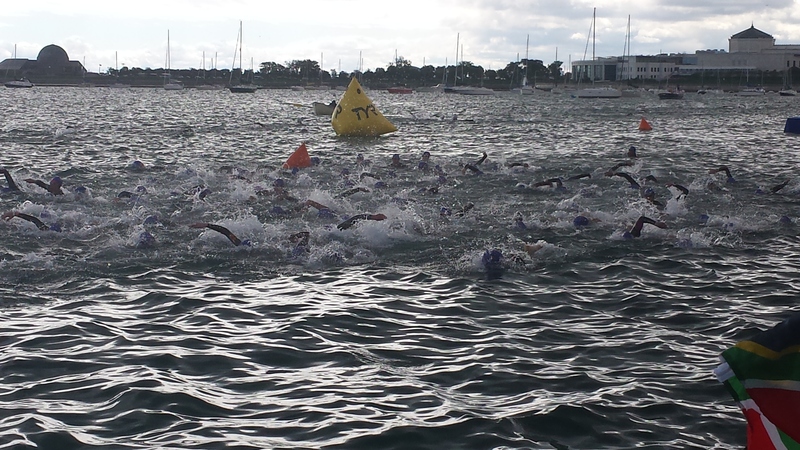 The route followed the harbour wall north for about 350m, round a buoy (or a booey as the swim Marshall called it!) then went south back past the swim start pontoon and all the way to the end of the harbour to the exit. We were called onto the pontoon and precariously made our way to the end to jump in. The pontoon was so unstable it was difficult to walk along it. I understand not long after my wave it actually broke resulting in later waves having a shortened swim and also diverting the elite men to have to use the age group exit and transition in an underpass! 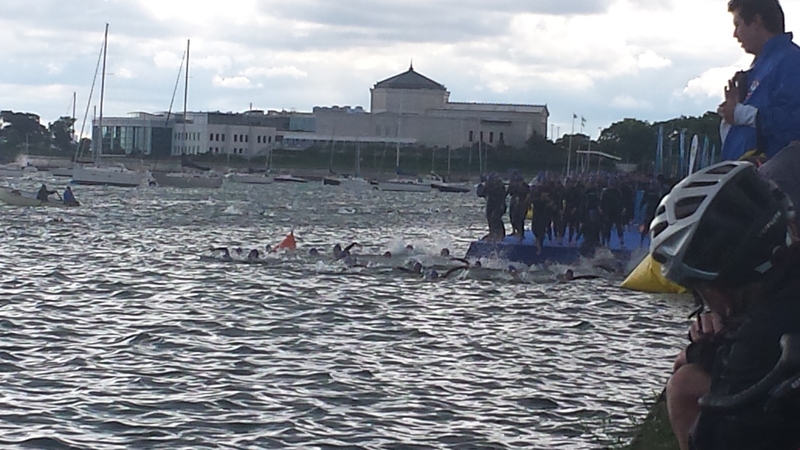 Swim start – bit of a scrum! I opted for a start on the left and we were off. I’ve been a bit hit and miss with my swimming in races this year. 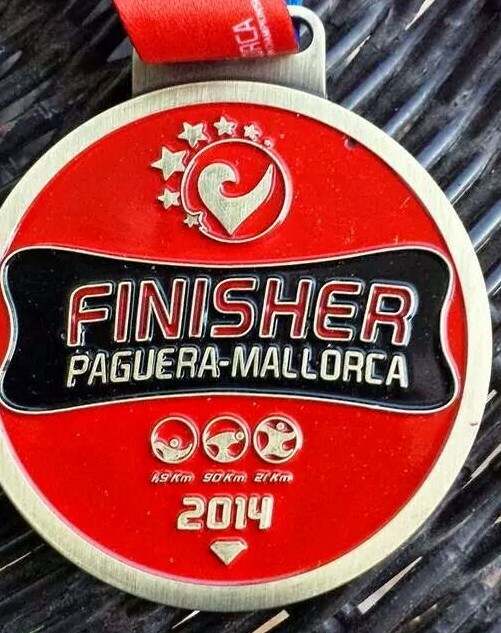 Training has gone well but in races I’ve either had a stormer or as in the ETU Champs a panic attack. As a result my last few races I’ve started nice and steady and then build throughout. This seems to suit me and psychologically works as I pass people towards the end of the swim. The downside of this means little draft opportunities. I was going well, came back past the pontoon and was pulling away from the group I was with. Only trouble was the water was so choppy I couldn’t see any swim exit buoys at all. I could see the Field Museum which I knew was near swim exit so used that as a guide and used the harbour wall to stay straight. Eventually I saw the final turn buoy and had to double back a bit as I was too far over but came out of the water ahead of the group I’d passed earlier and started the 500m run to transition. I wiped my sandy feet on my wetsuit – top tip from the sprinters – bike shoes on and I was on my way. I’m still not brave enough to do the shoes on my bike thing yet but this does have it’s advantages as I was moving very quickly passing quite a few girls still grappling getting their feet in. I capitalised on this and rode hard knowing the course was flat. 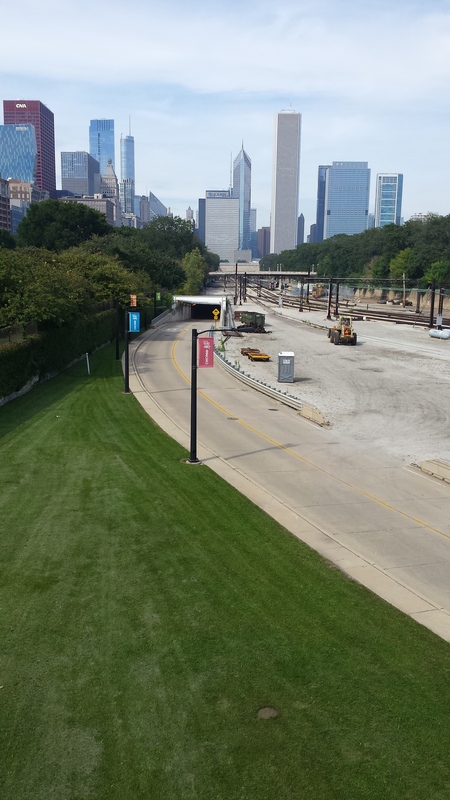 The Chicago bike route was rather unique in that no competitor had been able to ride it before the race. We’d all seen the route map, been warned about the change of light conditions and also the dodgy narrow tunnel on the secret road. So, it was with some trepidation that threw myself into the bike leg and despite the lack of course knowledge I loved it. 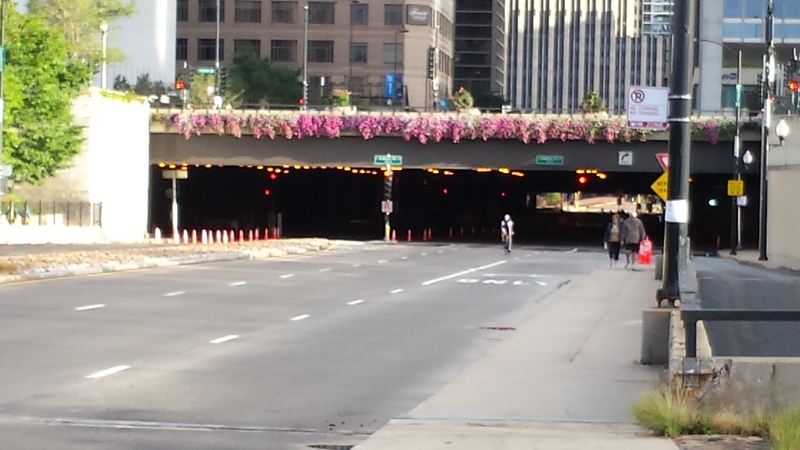 Much of the course followed Lower Wacker Drive. To the film buffs out there you’ll know this better as the tunnel in the Dark Knight where the Joker and Batman chase each other. It was fab to ride in – part was open on one side, then it turned dark – and was rather quick. I was grinning like a Cheshire cat – not many of us in this world have had the opportunity to cycle down here and I was loving it. Judging by some of the other whoops and yells I could hear so were others! Following the tunnel, we surfaced briefly before entering the ‘secret road’, a private busway that runs alongside the train tracks. This was just like a normal road but in a cutting and partly underground. It was rather narrow in places so made it difficult to pass and it was clear there was a lot of drafting going on. I pushed on although I was conscious I had been passed by a fair few girls. I was passing people but more were passing me. After Edmonton where I had about the third slowest bike split in my AG I had resolved to work on my bike over the last year so that didn’t happen again. I got my head down and pushed on. We arrived back near transition, did a 180 turn and went back out for another lap. Two GB girls had caught me up and overtaken me and I worked like hell to catch them back up. After a fair bit of cat and mouse I hit transition ahead of them both – just! My bike time was solid midpack and I know there is still so much more to come. It was a long run from dismount to the racking and was not a comfortable experience in bike shoes – another thing to work on next year – I was so pleased to get my trainers on and start running. The run was 3 and 3/4 laps. Not the most inspiring of routes but we got to run around the Buckingham Fountain four times plus it was great for supporters. I got to see them twice on every lap which was great for morale. 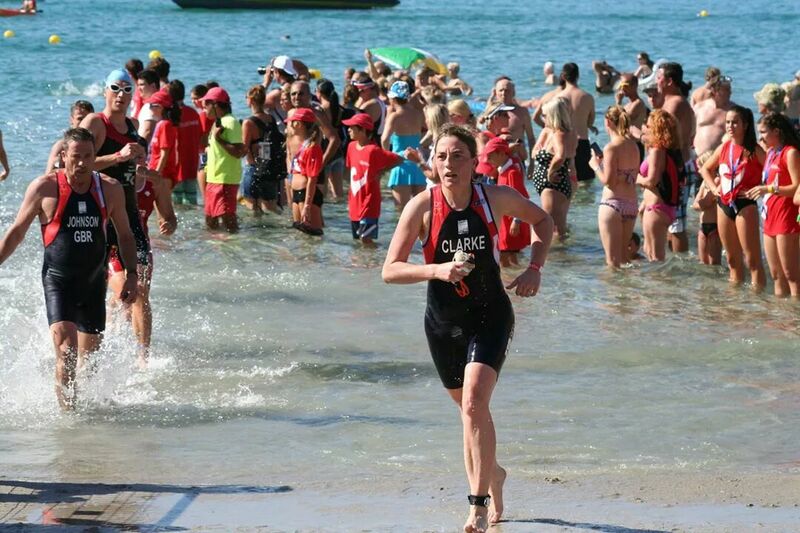 After a fantastic start to the season I had trouble with my calf from late June resulting in a painful 10km at the ETU champs in Geneva, thought it was fixed until a week before Vitruvian in late August when it went again, resulting in a great swim/bike at Vitruvian but a DNF on the run. I had done very little run training as a result so was quite nervous about this final leg. As it was probably my last race of the season I was just going to go for it and if it went it went, I’d blinking well crawl to the end if I had to! Mercifully after a steady first km all felt good and I felt good. I’d got a good pace going and was passing people. I passed a few GB girls so knew I was going well. The heat was rising so maintaining pace was difficult but I dug deep and left nothing behind and made it to the finish in one piece! 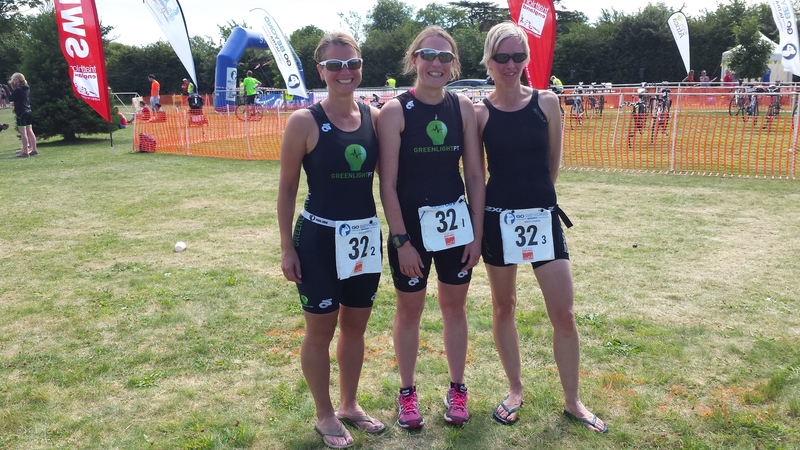 I finished in 37th place and fourth GB in my age group – a massive improvement on last year where I had very few girls behind me in the race and was last GB home! I was super proud – one of my best races of the season, my swim wasn’t my fastest, nor my bike or run but overall as a race it all came together. After a summer of injury it finally came good at the right time. My improvement this year is no small part a result of my coaching from Adam Gibson at GreenlightPT. It makes such a difference to have someone else doing the thinking about what training needs to be done and how much and when and keeping it interesting. It means I can just get on and train. Working full time with a young family means one less thing to worry about. Another benefit is the voice of reason when you’re heading for disaster. Under normal circumstances I’d have hobbled round Vitruvian as I was in an age group podium place at the time but going into the race I was under strict instructions to stop if there was any pain otherwise I’d most likely jeopardise Chicago. Deep down I knew this but sometimes you need someone else to tell you it. Coaches know their stuff and you have to trust them! I have also had brilliant support at home from friends, work colleagues, teammates at GreenlightPT and Redway Runners but most of all my family. I was lucky enough that my husband, son and sister were able to make the trip to Chicago with me and it does make a difference to have them there – especially my husband when my bike doesn’t do what I expect it to do (hence a dash to the LBS to buy new pedals!). It’s been a brilliant season, probably my best to date and I know there’s still more in the tank for next year. Just one last little local triathlon at the weekend and that’s me done for the year. 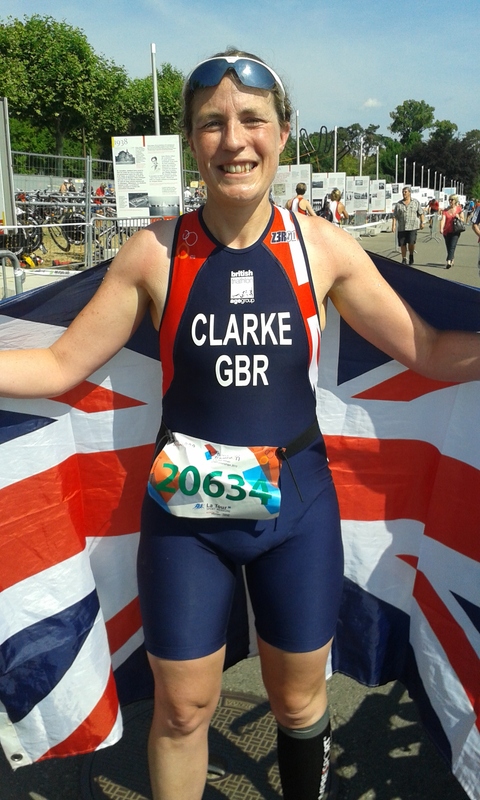 Exactly one year ago today, I made my GB Age Group debut in Edmonton at the ITU World Championship. 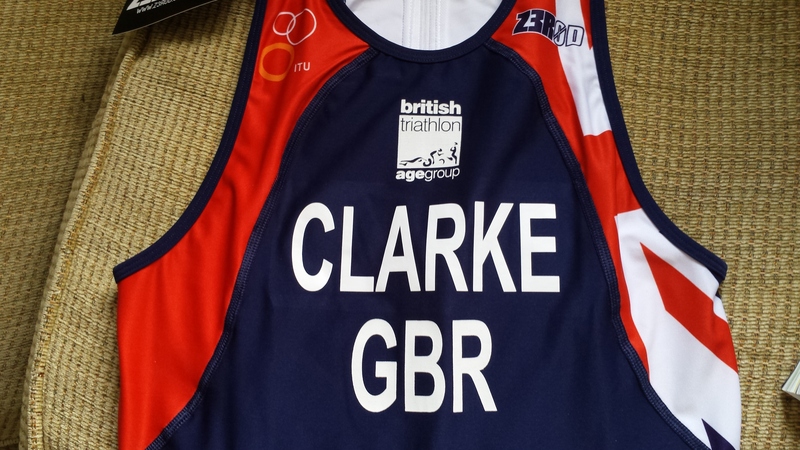 In three weeks time, I get another opportunity to race for GB in the 2015 World Championship in Chicago. I targeted qualification for the World Champs at the start of the season and registered myself for all three qualifiers. With Outlaw Half at the end of May sandwiched between the qualifiers it was a busy couple of months but under the guidance of my coach Adam at GreenlightPT managed to perform well at all three qualifiers and Outlaw and managed to win my age group at the first qualifier at Belvoir Castle and therefore booked my place for Chicago! I was really pleased with how this first half of the season went. I was swimming, cycling and running faster than I have ever done and for the first time ever actually pass people on the bike leg! 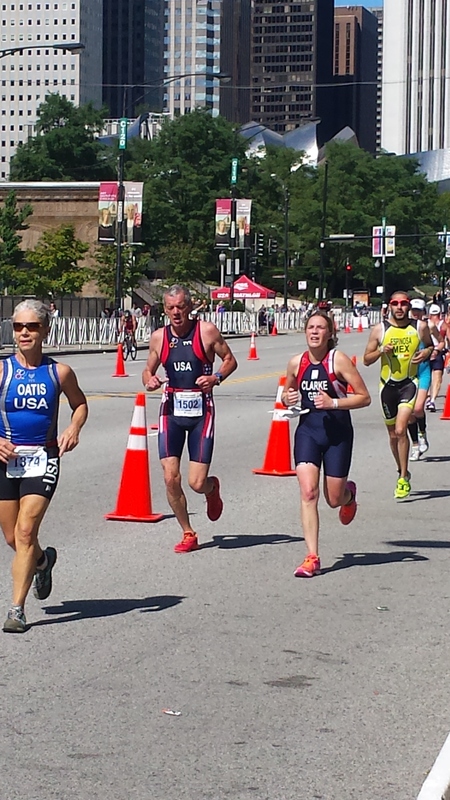 With Chicago in the bag, it meant the pressure was off for all my other races. 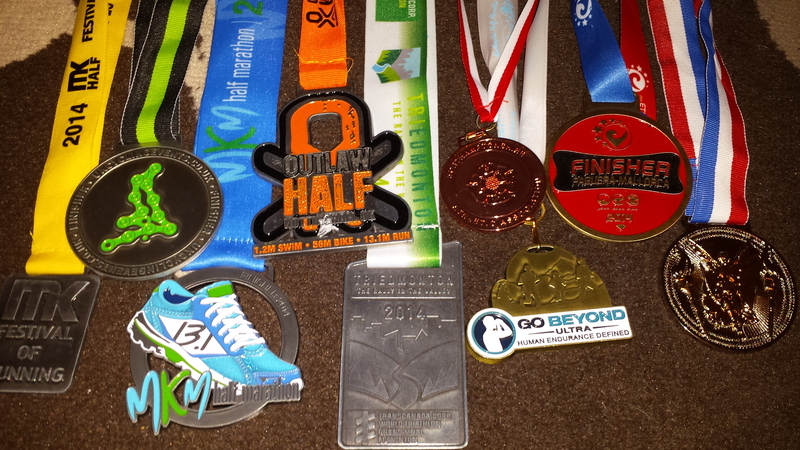 Outlaw Half was a great experience again. 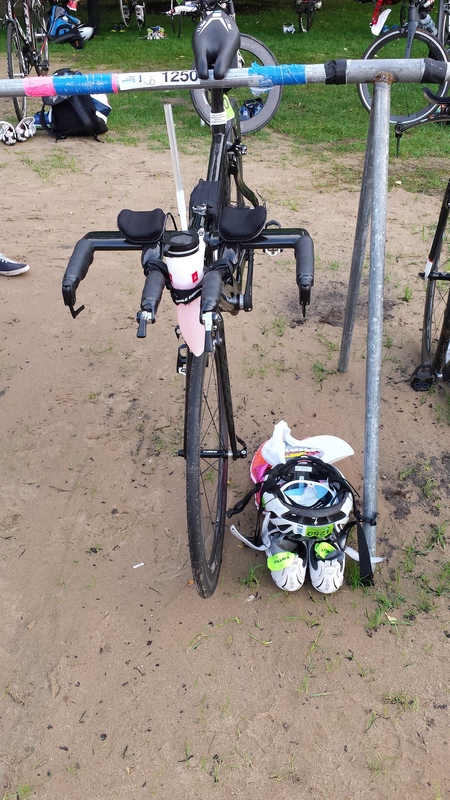 The weather was awful – it poured from the start of the swim, all through the bike and then dried out for the run but I loved every minute of it. 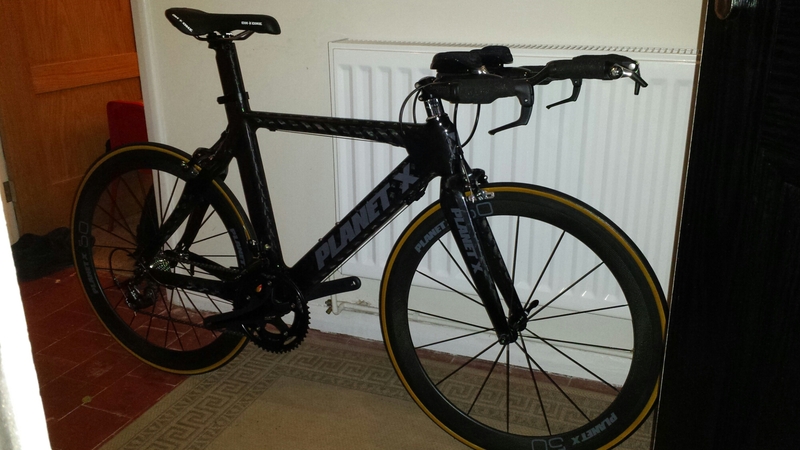 Despite the weather, I knocked nearly 5 minutes off my bike time – which was pretty good considering most of the bike leg was under water and it was my first ride on my new TT in the wet! I’d set myself a target of 5:30 – 11 minutes quicker than last year and on the day came in at 5:31 – partly due to the weather on the bike course and blowing up towards the end of the run. But, it was still a 10 minute PB and I know in decent weather there’s plenty more to come there. The other two qualifiers Deva and Dambuster were also really good for me. Having spent three years in Chester at university I was excited to race here and I wasn’t disappointed. It’s a fantastically well organised race with a great course. Even got myself on Breakfast TV and the Channel 4 highlights by virtue of the fact I came out of the swim with TV host Louise Minchin! The bike course was fast – my fastest ever ride and the run, on paper sounded dull – three laps of the Meadows and along the Groves – but in reality it was great, really pretty and varied terrain. It was also the National Champs so I was super pleased to finish 7th in my age group. I really recommend this event and hope to go back next year. Dambuster was another favourite of mine. I qualified for Edmonton here last year and the course suits me – the bike is interesting with the first third very hilly (the Rutland Ripples), the second third mostly downhill and the final third lots of ups, lots of downs and not a lot inbetween. It’s challenging to say the least but you are rewarded with a nice flat out and back run to finish. With things looking up I settled into some training ready for the European Champs in Geneva when the old calf problem raised it’s head again. With three weeks until Geneva it was a race against time to get fit. 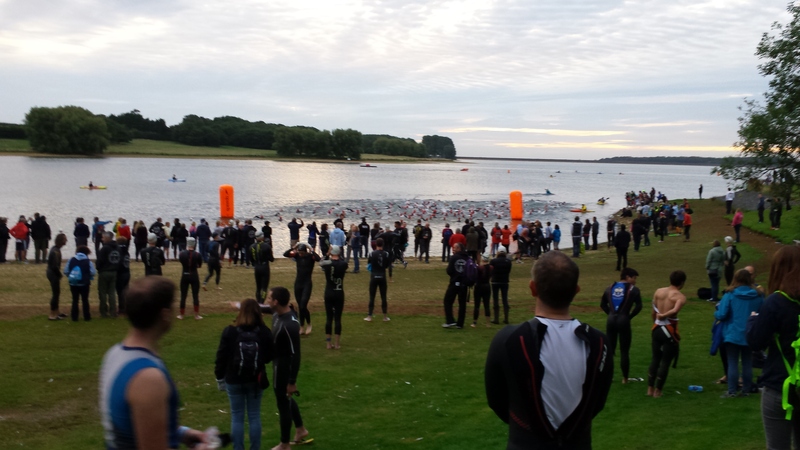 Unfortunately it didn’t go to plan – with a panic attack in the swim (don’t ask! ), an ok bike leg, the run was a painful 10km. My first experience of the European Championships is one I’d quite like to forget! It was a great event in a beautiful location but for me, not my best experience. Post race in Geneva – at least I’m smiling! Post Geneva, I settled back into training and trying to get my leg sorted. All seemed well by the start of August and GreenlightPT took part in a fun relay event, well sort of fun, it was the East Midlands relay champs and for me, I felt I was back on form – running still had a little way to go but after three weeks out it wasn’t too bad! My team – the ‘Green Goddessess’ came third in the women’s race so bit more bling for the collection and a good day out was had by all. Green Goddesses – 3rd place! 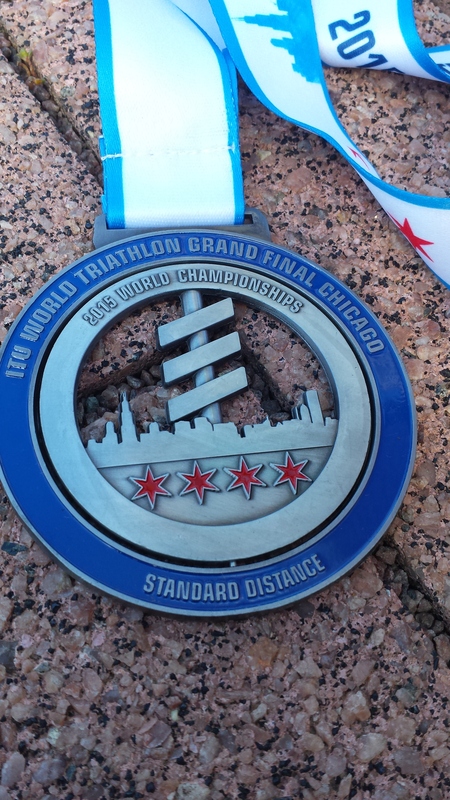 Before Chicago I had one more event to do – the Vitruvian. It’s basically Dambuster, twice over and was an event I’ve been keen to do for a few years. Roughly three weeks before Chicago it’s a good gauge of my fitness and form and I was hoping to get a decent 70.3 time (bike is a bit short so was hoping for sub 3 hours on that leg). But, as has been the case this year, for every high, another low and a week before I tweaked my calf again…With physio and staying off it and praying it was just a bit tight I went ahead with the race on the understanding if I got to the run and it hurt – to stop. It was a real pain as I was swimming well, biking quite well (a lack of proper run training means more time on the bike) and I can normally wing the run despite no training. I felt good race morning – after my disastrous swim at Geneva I was keen to put that right and adopted a different more relaxed approach – i.e. forget about everyone else and do my own thing. It worked and I really enjoyed the swim. It was a two lap route with a short run between loops and I came out first in my age group. Straight onto the bike, knowing there weren’t too many girls in front and I got my head down – bit too quick for the first lap – I did it quicker than I’d done Dambuster – that’ll hurt later! A girl from my age group passed me on the first loop but I managed to maintain second and hit the run in 10th place overall – not bad for me…the run started well. I was under strict instructions to keep it slow which was hard as my legs wanted to go much quicker but eventually I settled into the agreed pace, but by 5km my calf was starting to twinge a bit. Not badly but enough to know it could put Chicago in jepoardy if I continued so at the 5km turn I decided I’d walk/jog back to the start and then drop out. Except I got to the halfway point back near transition and the commentator announced I was still in second in my age group (despite my walk/jogging effort!) and the competitor in me took the turn around and carried on. However, 400m further along my sensible voice came through and I took the decision to stop. It was one of the hardest decisions I have had to make – to be in contention and then walk away was really difficult but I know it was the right one. I swam really well, I biked well (2:41 split) – so it wasn’t a wasted day and I still got my hoodie! And here were are today. 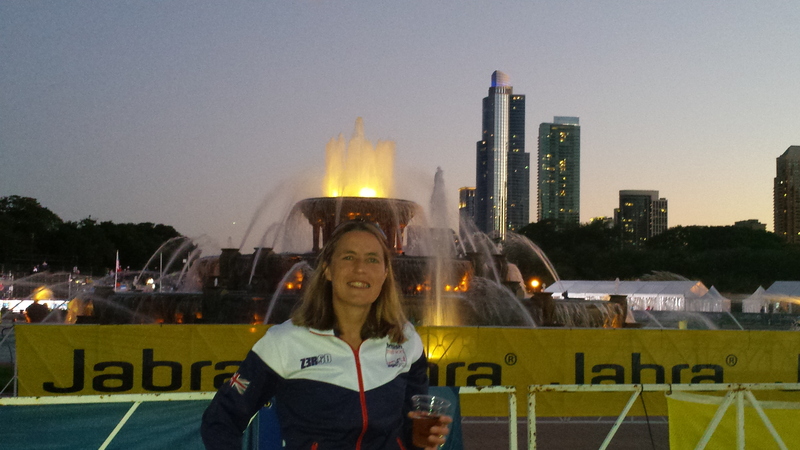 A year since my GB AG debut and now looking forward to Chicago with a few more weeks training to get done. Not sure how much running I’ll get done but hey it’s only a 10km and I’ve nothing else in the diary after September – I’ll blinking well hop round that Buckingham Fountain if I have to – bring it on! It has to be said, from my point of view, it’s been a pretty awesome year and beyond my wildest expectations. I knew deep down with the right training and some luck with injuries there was some good stuff in there but I just needed to get to it! But with support from my family and friends and some fantastic help from GreenlightPT, I achieved things beyond anything I could have predicted at the start of the year. My swimming has gone from strength to strength, my cycling is getting there and my running has hit numbers I never thought possible. Running with Redway Runners is always good fun and there’s always someone to run with and the GreenlightPT squad are a great crew – swimming on a Wednesday has been such good fun, even when we’re a mess by the end of it. My proudest moment was the parade from the athletes tent in Edmonton to the lake for the start of the ITU World AG Champs – we were led by pipers and I’d be lying if I said I didn’t have a lump in my throat. So, what about 2015? Well I hope for more of the same – I’m giving GB AG qualifying a bash with the hope of a slot for Chicago and also getting that sub 5:30 for a half ironman. I’m actually (for the first time in about 5 years) hitting New year uninjured and raring to go. I’m working with Adam at GreenlightPT again and hope to outdo this year – it’ll be a tough call but I’m ready…are you?